Steel Town Looks At Its Future, And Sees Rebirth The Great Recession hit the industrial Midwest especially hard in recent years. Now, though, local leaders in at least one small Illinois city believe the worst is finally behind them. But they need to diversify — and attract new residents. The old Granite City Steel Mill is now owned and operated by US Steel. 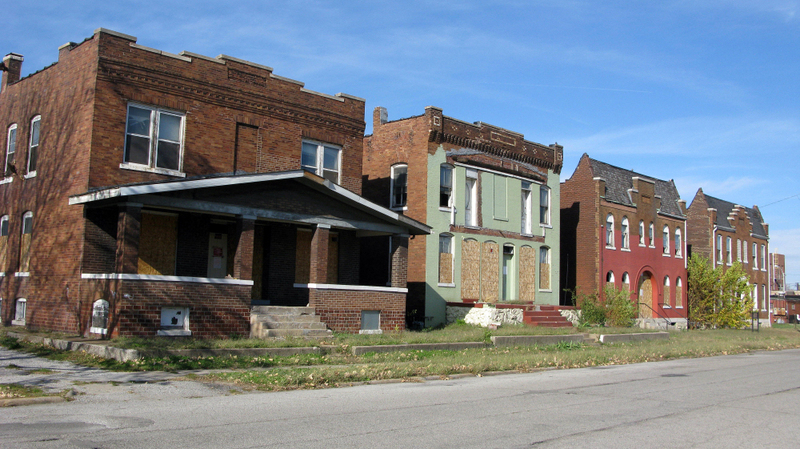 The Great Recession has hit the industrial Midwest especially hard in recent years, from big cities to small factory towns. But now, in at least one small Illinois city, local leaders believe the worst is finally behind them. Sitting across the Mississippi River from downtown St. Louis, Granite City, Ill., has certainly seen better days. In its downtown, there are more boarded-up and empty storefronts and vacant lots than there are businesses. In last year's census, Granite City's population dipped below 30,000 — down from a peak of over 40,000 in the 1970s. And many people here say good-paying jobs are hard to find. "People are struggling," says Tammy Scaff, 49, sitting at a computer in Granite City's downtown library. Scaff says she's working part time at the Kmart on the outskirts of town; she also works part time as a home care aid to the elderly. Those two jobs pay minimum wage. She's looking for a third. "The economy is not good; it's not good at all," Scaff says. "Several of us have had to have two or more jobs. A lot of people are having to use the food pantries or get help through the government and stuff." The library's staff say they're doing a brisk business with local residents who come to use computers and other job-searching resources. Unemployment in Granite City is 9.5 percent, quite a bit higher than the larger St. Louis region. Several nearby factories have cut staff or shut down. But the backbone of Granite City's economy is steel. "It's a hard-working town; they are totally reliant on the steel mills," says Dan Simmons, president of United Steelworkers Local 1899, which represents most of the 2,200 workers at the U.S. Steel Granite City Works plant. 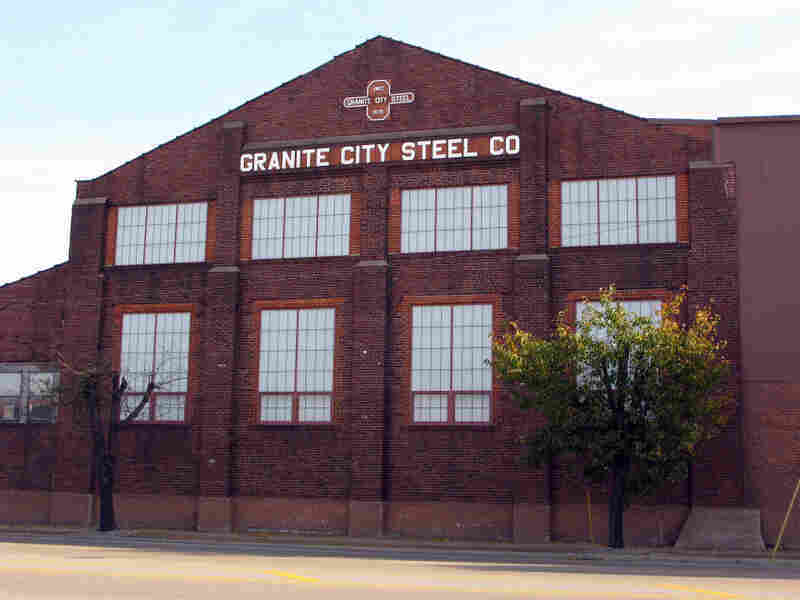 In its heyday, as Granite City Steel in the late 1970s, the plant employed more than 4,000 workers. "It is the absolute heart of this city, of this community," says Randy Virgin, another Local 1899 official. In and near its downtown, there are more boarded-up and empty storefronts and vacant lots in Granite City, Ill., than there are businesses. Virgin says he saw proof of that in late 2008 and 2009, when U.S. Steel temporarily shut down the mill and laid off almost everyone. "When this plant was idled for the first time in its 130-year history ... it was amazing, the change that you saw take place in the community," he says. "The restaurant across the street here was empty; the Walgreens on the corner, there were no customers inside." Virgin says everyone here knows that as goes the mill, so goes Granite City. And after reopening in mid-2009, the mill is now going pretty good. It's fully staffed at about 2,200 employees. And U.S. Steel has invested in recent upgrades at the plant. "Its future is probably more secure now than it's been in a long time," he says. "And these are good-paying jobs." Wages at U.S. Steel start at around $20 and top out around $30 an hour. And in a sign of the hard economic times, both of the union officials say that they're seeing more college graduates — though far outside of their fields of study — apply for work at the steel mill. Virgin says that it's still dirty, difficult, and dangerous work, with long, irregular hours. "When I first walked in, it looked like Dante's Inferno, [and] Paradise Lost," he says. "You saw this steam rolling through, and this orange glow — and I thought, 'What have I done?' "
Brenda Whitaker worked on that hot, grimy, steel mill floor for 15 years. But now, she works just down the street and over the railroad tracks, in a place that seems a world away. In this hardscrabble, cold steel town, the 49-year-old Whitaker opened her own cute, quaint little lunch restaurant, called the Garden Gate Tea Room. She decorated it floor to ceiling with garden tools, old photographs and all kinds of little knickknacks and trinkets. Her customers eat to the soft sounds of jazz vocalists like Frank Sinatra and Diana Krall. So what did the guys back at the mill think? "Oh, my gosh! They looked at me like I was crazy when I first opened this. Because, right in the heart of an industrial community, you have this little oasis," she says. "In the springtime, we have the most beautiful garden, and we have alfresco dining and people sit out. And it's just, you close your eyes for a minute, and forget where you are. And then all of a sudden, you feel the roar of a truck coming by, and a big piece of steel on it — and you realize you're back in Granite." Business is pretty good, Whitaker says. She keeps her overhead low and didn't get caught over-extended in the recession. 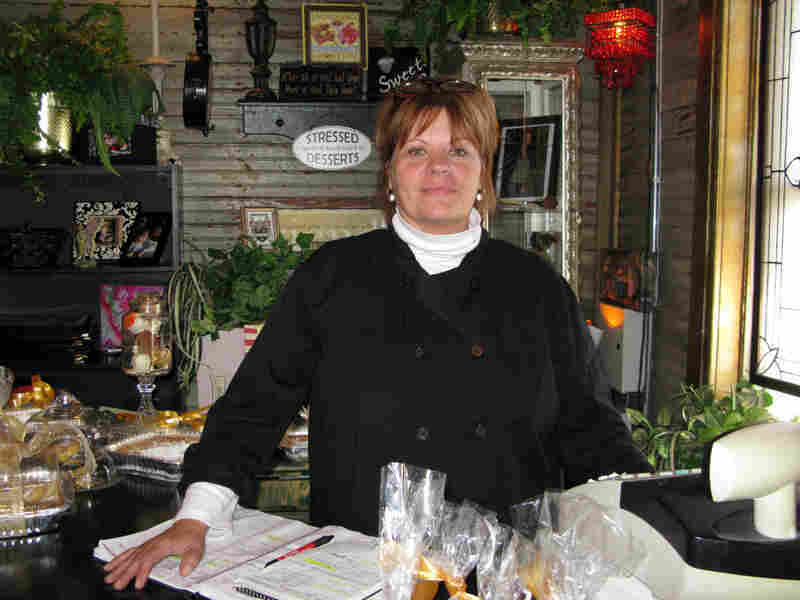 Brenda Whitaker, owner of the Garden Gate Tea Room in Granite City, Ill., is a former steelworker and lifelong resident of Granite City. She calls her quaint restaurant "a different world," from the one she left behind in the steel mill a few blocks away. After opening the tearoom, Whitaker won a seat on the City Council, where her main focus now is broadening Granite City's economic base. "I think we have always been defined solely as a mill town," she says. "I think we have seen, especially when the mill laid off, that we have to diversify." Born and raised in Granite City, Whitaker says the days of the "gold watch jobs," like her father's, where someone can expect to work 30 to 40 years at a factory or steel mill, are long gone. The future, she says, is developing and luring small businesses to fill some of the vacant storefronts and empty lots in Granite City. And so far, she says, it's slow going. "The city just built, a year ago, a new movie theater, and that was the first anchor," she says, "so that has started to stimulate interest." Whitaker says Granite City can no longer depend solely on the steel industry, even though it is critical to the town's economic future, which she acknowledges is one of the biggest challenges in drawing new residents and businesses. "People only see us as a dirty steel town," she says. "And we're much more than that." In addition to small businesses like hers, Whitaker points to the city's large hospital, a major expansion project at its Mississippi River port, as well as its parks and schools and its 6-mile drive to downtown St. Louis as reasons she believes Granite City has a bright and vibrant future. She is hoping others will come to see it, too.